If you're the kind of person who enjoys cooking delicious food that happens to be healthy, drop everything and read this post. J was gone over this past weekend. Naturally, I divvied up my time between entertaining the dog, browsing Amazon, and attempting to better my life through Pinterest. I pinned approximately 572 crockpot recipes and 67 pancake recipes--all of which I planned on making that same weekend, duh. 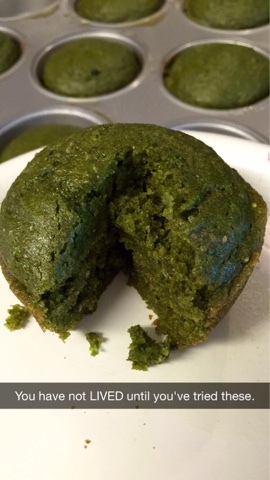 I also happened to pin a recipe for spinach muffins. Shut the front door. 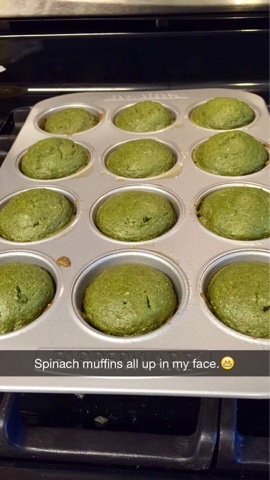 Spinach muffins?! Right now I'm at a stage where finding healthy recipes that also taste great makes me feel like I'm winning at life. So, you can imagine my excitement. I used this recipe from The Green Forks. The entire preparation and baking process took a whopping 30 minutes and the results were A.MA.ZING. The muffins were also approved by my neighbors and co-workers. I believe one direct quote from a co-worker went something like this: "MmmmMMm nomnomnomnom". Added a handful of chia seeds. They are packed with protein and fiber. Plus, their texture and flavor is similar to that of poppy seeds! Yum. Use more chia seeds. You can never have too many chia seeds. Think of all that fiber! I hope you guys enjoy these muffins as much I did. I will definitely need to try these! I'm always looking for more healthy ways to eat dessert, if that is even possible. :) Thank you! Love your blog! Cheers, I love your style! these look delish! do you happen to have the recipe? It looks like the site you got it from is down =( thank you!! Here's a direct link to site's recipe. Hi! I just clicked the word "this" (this recipe) to get to the link to the recipe, and my screen said "hacked by blood slayer"! What is that? That was really scary. I hope I didn't get any kind of virus. I've never seen anything like that! Might need to add an update to the post, so no one else gets that weird screen!